BetOnline’s guiding principle is to establish long-lasting, positive relationships with its customers to achieve their goal of becoming the top online Sportsbook and Casino. BetOnline is based out of Panama and currently accepts U.S. players. BetOnline strives to introduce innovative technology and incredible customer service to satisfy the needs of its customers. Available games at BetOnline include Pot Limit, Fixed Limit and No Limit Hold’em with stakes from as low as 1 cent/2 cent up to $50/100 NL. BetOnline also offers table sizes to fit your needs as they offer, heads-up, 4 max, 6 max and full ring (10 players) tables. If you are an Omaha player, BetOnline offers both regular Omaha and Omaha Hi/Lo in Pot Limit, Fixed Limit and No Limit formats with stakes ranging from $.05/.10 to $1.50/3. For Sit’N’Go players, BetOnline offers a variety of sit’n’go tables at a variety of stakes. From heads up to 6 players to 10 players and your choice of playing turbo or normal speed you can play in sit’n’gos at BetOnline for as little as 5 cents or for as much as $200 + 10. If you are a freeroll or lowstakes tournament player, then BetOnline is the site for you. BetOnline offers a freeroll tourney every hour on the hour and has a daily schedule offering numerous lowstake tourneys between $1 to $20 some of them with guaranteed prize pools. 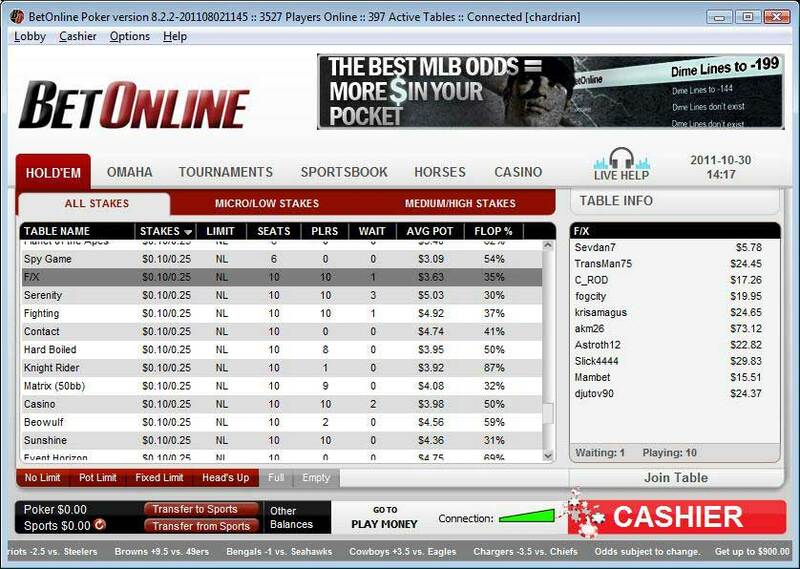 BetOnline’s software is pretty standard for online poker sites. When you open the lobby you have the option of choosing the Hold’Em, Omaha or Tournaments tab. Within each tab you then have the option of filtering further. For example in the Hold’Em tab you can choose all stakes or filter it down to micro/low stakes or medium/high stakes. Likewise, on the bottom of the lobby you can filter what type of game you want to play (No limit, Pot limit, or Fixed Limit) as well as filtering for Head’s Up tables or filtering the empty tables from the lobby. Once you have chosen your table and sat down at an empty seat the table layout is very basic but very functional as well. There are no avatars to choose but the software does provide the standard auto muck, sit out next hand, and auto post blind functions. In terms of betting, there is a standard bet slider as well as 1/4 pot, 1/2 pot, 3/4 pot, min raise, pot raise and all-in buttons. You also have the option to tile your tables or to minimize them. And of course you can access the cashier and live help at any time. Overall the software is efficient, self-explanatory, and easy to use. With their live help button you also can request assistance if you ever do need it. The action at BetOnline at this time appears to be geared towards low to medium stakes cash games and for freeroll tourney players. If you are looking for a NL game with stakes between .01/.02 to $.50/$1 then you should have ample opportunity to find a good game. It looks like some $1/2 6 max games as well as the occasional full ring $1/2 or $2/4 game might run sometimes as well. For Omaha the action appears to be a couple of tables running with stakes from .05/.10 up to .25/.50. The real action at BetOnline pokerwise is in their freerolls. On a Sunday afternoon, their freerolls have at least 1000 entries and offer anywhere from $10 to $100 in prize money. So if you are looking for a site where you can start earning a poker bankroll without having to risk any money, then BetOnline looks like a good place to visit. Poker has become a tougher game to consistently beat over the last ten years, but with the majority of the players coming to BetOnline to use their Sportsbook and playing mostly lower stakes poker, the fish factor is still pretty high. Assuming you play quality ABC poker, you should be a consistent winner on this site. 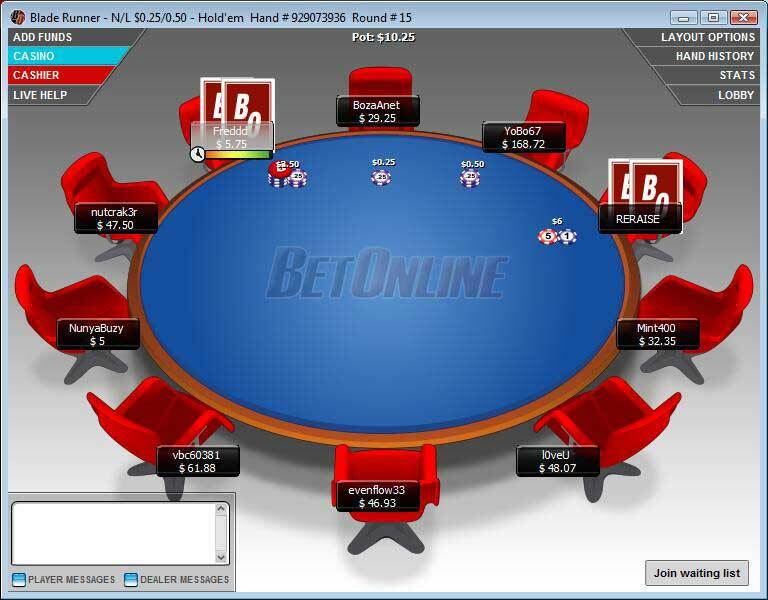 At this time, Bet Online offers a 200% up to $2,000 bonus for poker players. To claim this large bonus, visit BetOnline using our links and make a deposit of at least $50. Then send an email to freeplay@betonline.ag with the subject line “POKERNEW.” Your Bet Online Poker bonus will become active within 48 hours. If you deposit an amount less than $1,000 and therefore receive a smaller bonus, then the actual numbers will differ for you, but the percentage bonus payouts and the POPs needed per bonus dollar will be the same as described herein. You’ll have to earn as much of this bonus as possible within 120 days. The ongoing promotions at BetOnline include a 4-of-a-kind bonus that will pay you $40 for achieving this type of hand on certain days. There’s an MTT leaderboard that grants entry into a freeroll to the top monthly performers in three buyin categories of tournaments. BetOnline has a live help button with operators who are always available and ready to help you. If you have a problem or question, the quickest way to resolve it is through the live help option. BetOnline strives to provide the best customer support to build and maintain trust with its clientele and keep you coming back for more. You can also contact BetOnline by calling Toll Free: 1-888-426-3661 or outside of the U.S. and Canada at +507-206-3369. By e-mail at cs@BetOnline.com. Or by Skype at PlayerServices.